Holiday Villa Kadyanda is in an elevated position with stunning views over a plateau and the mountains. The area has everything that you could want with friendly people, lovely beaches, all types of water sports and many good restaurants. 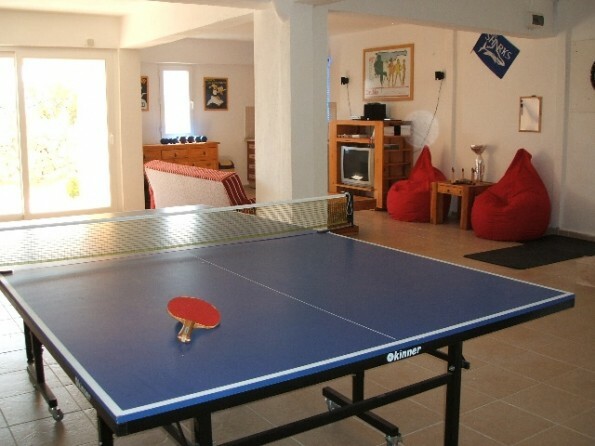 Sleeping 13 and with a private pool with child friendly barriers, gym and games room, this is the perfect escape! The local area is based on the traditional Ottoman village of Uzumlu which is agricultural with an emphasis on growing grapes. There is a quiet rural existence which is not significantly influenced by the few expats who live there. The heart of Uzumlu village is a square bordered by home-produce shops, a post office, Internet cafe, a mosque as well as the inevitable tea-houses. Wandering around the small lanes that fan out from the square you can see women weaving cotton on traditional pedal looms in front of their houses. There are a number of restaurants and an excellent modern wine bar offering local wines and good food. 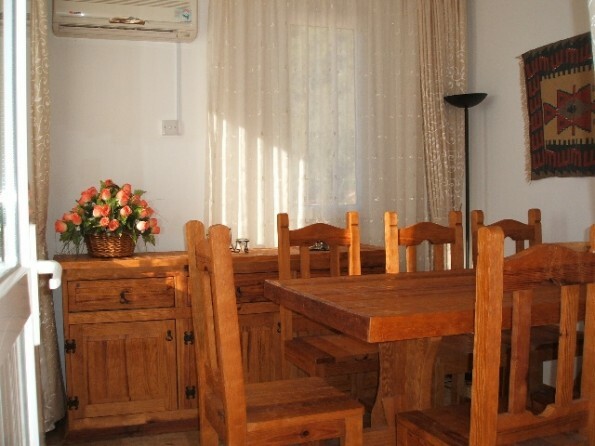 There are five other restaurants within a short distance from the villa - Uzumlu village itself is under 2km from the villa. Fethiye is 17km away, you can use use the regular Dolmus minibuses or it's an easy 25 minutes drive to a bustling port with lots to offer. By the harbour you can walk past the boats or relax in the many bars and tea-houses. Calis Beach is 20 minutes from the villa and has a 5km shingle beach, many bars, restaurants and a water park - you can also get to Fethiye from here by water taxi. 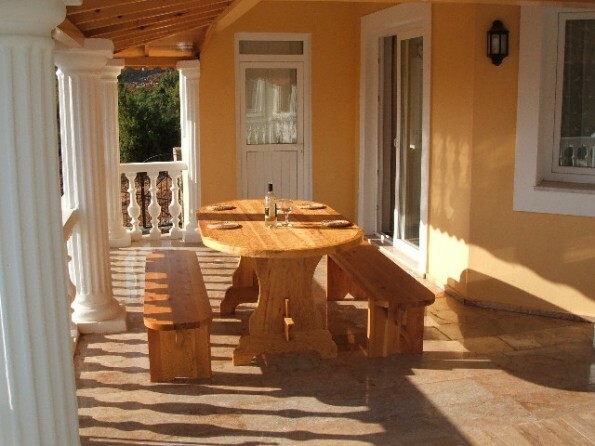 Olu Deniz, lively Hisaronu and Kaya Koy ghost village are all a short distance from Fethiye. 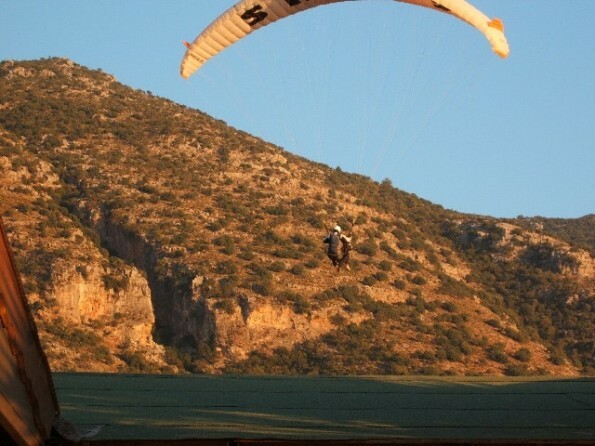 Along the Lycian Coast there is paragliding at Olu Deniz, microlights, windsurfing, kite-surfing, sailing, swimming, water-skiing and scuba diving. While inland there is walking, mountain biking, quad biking, horse riding, jeep safaris, bird-watching and visits to the numerous Roman and Lycian archaeological sites. Leaving Dalaman Airport you head for the D400 towards Antalya and after about 25 minutes you turn left to Uzumlu on the Denizli road. After a further 10 minutes you pass Uzumlu and then after a further 3km turn right at a sign to Villa Kadyanda up a dirt road. 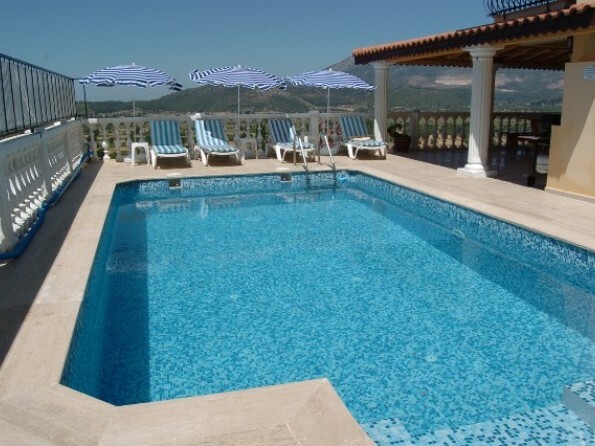 There is a lovely illuminated private pool with complete child protection which is surrounded by a large terrace with ample sun loungers and parasols. Throughout the summer there is a gentle cooling breeze that makes the terrace an idyllic place to relax. By the side of the terrace there is a covered marbled area with a large dining table close to both a gas and a charcoal BBQ for alfresco dining and there are incredible views across the plateau. Near the entrance is a separate paved area that can be used as a breakfast patio. 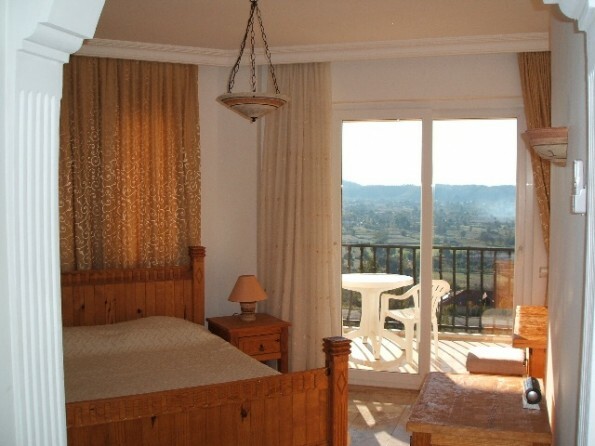 There are three furnished sun terraces, two are outside the three double bedrooms that overlook the plateau and the other outside the twin bedroom that overlooks the mountain. Above and below the villa are grassed areas with fruit trees and shrubs. 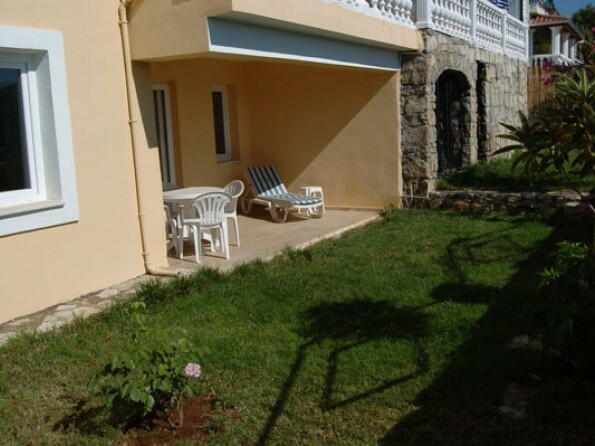 The lower garden has another sun terrace that is accessed through the patio doors from the Villa Gym and Games Room. 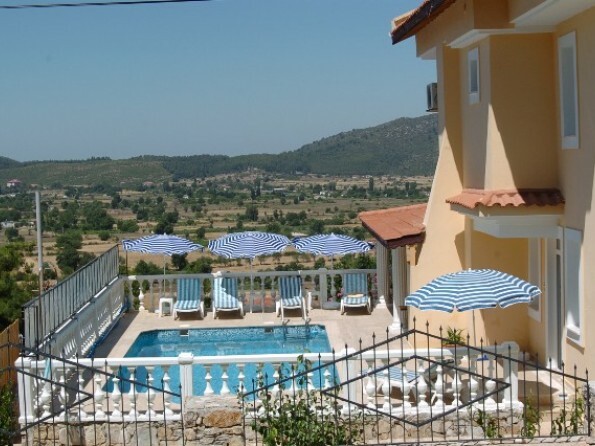 The villa is 45 minutes from Dalaman Airport, 20 minutes from Calis Beach and 30 minutes from Fethiye & Olu Deniz Blue Lagoon. 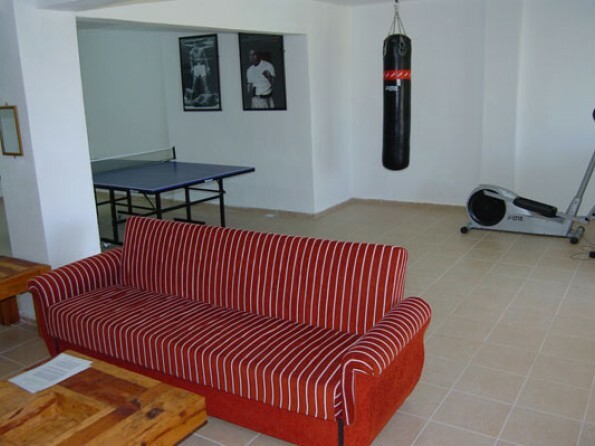 Close by are the shops, restaurants, wine bars and a weekly market in Uzumlu village. The Roman/Lycian city of Cadianda is behind and above the village at 900m and is reached by a dirt road which is a 15 minute drive from the villa - the site is well worth a visit for the fascinating archaeology. 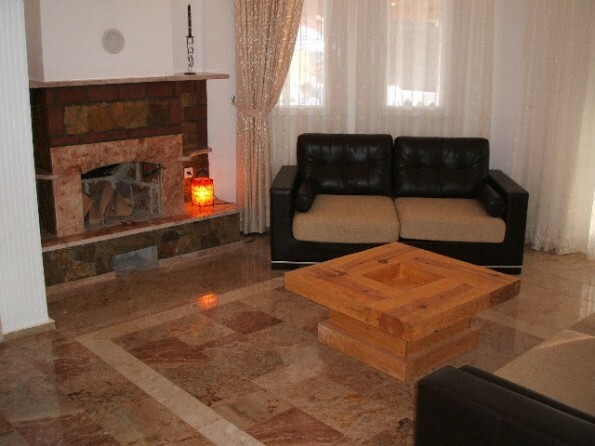 The weekly rental rates are for the whole villa, including all utilities, and there are no extra charges. HM Forces, Emergency Services and small groups of less than 8 can deduct 15% outside the Peak Season. To book you pay a 25% deposit with the balance paid 8 weeks before arrival. We can arrange return transfers from Dalaman Airport and we can also arrange vehicle rental. All 2 week holidays include free return transfers from Dalaman Airport.